The fear and pain for that creature is felt in your words, Hully. Well written! People are excused for being human, but animals are never excused for being animals. This actually happened this morning. The poor thing didn't know what to do, and the traffic just had to follow the directions of the police. I just hope they got it calmed down. Horses and other animals on the road happens way too often. This happened this morning -- at the worst possible time with all the school traffic on top of the work traffic. I just hope it ended up okay. Thanks so much for giving this a read, Mike. An excellent poem, Hully, the terror of the horse so vividly expressed. I see from your reply to Jeff, it was an incident that you witnessed today. 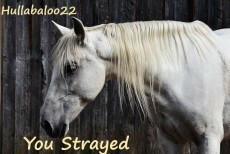 I just hope the poor thing was taken back to safety and is now in a stable munching hay. How very upsetting! I just wished that I was a horse whisperer or something (I know it sounds stupid), but the poor thing did not want to be put in to the horsebox and the traffic was making it almost crazy with fear. It had gone later, so I guess all ended well. Thanks so much for reading, Sue. Awww, this struck chords inside of me, Hully. Excellent work. Thanks for giving it a read, jaylisbeth.